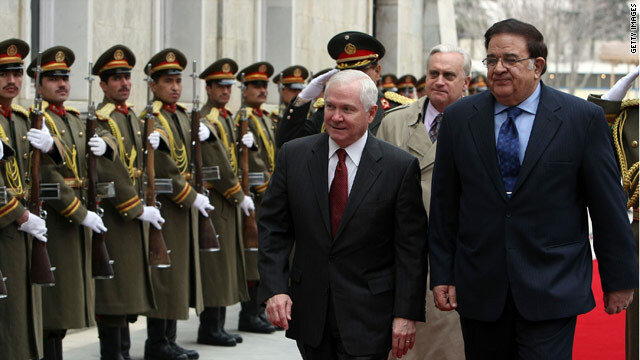 Defense Secretary Robert Gates, center, walks with his Afghan counterpart Abdul Rahim Wardak in Kabul on Tuesday. Kabul, Afghanistan (CNN) -- U.S. Defense Secretary Robert Gates told Afghanistan's President Hamid Karzai on Tuesday that the United States "will never turn our back" on Afghanistan. Gates, who is on an unannounced visit in the war zone, held a joint news conference with Karzai. "President Obama is sending 30,000 more U.S. troops, the first of which are scheduled to arrive within days," Gates said. "Afghanistan's international partners have pledged at least 7,000 additional troops; when all is said and done, some 43 nations will make up a force." Gates also was scheduled to meet with Afghan Defense Minister Abdul Rahim Wardak, as well as American military officials. Karzai has asked for patience as his nation struggles to take control of its own security. "A number of years Afghanistan will not be able to sustain our force with our own resources, " Karzai told reporters. "We hope the international community and the U.S. will help Afghanistan reach the ability to sustain our force with numbers and equipment." Obama has said that U.S. forces will begin withdrawing from Afghanistan in July 2011 -- at which point international troops would begin to turn over security responsibility to Afghan forces. Gates spoke about the U.S. commitment to Afghanistan on Tuesday. "Our relationship with Afghanistan is a long-term commitment," Gates said. "As security improves our relationship grows ... especially with economic and political development. As President Obama said, we will never turn our back on the region." Karzai also offered his own timeline goal, saying Afghanistan wants to be able to assume security control in some parts of the country in two years, and to lead security for the entire country by the end of his five-year term, which just started after his recent re-election. "We as Afghans will try our very best to reach that goal, and we hope our allies will back us to reach that goal," Karzai said. Building and developing Afghan security forces will be a continuing challenge, Gates said, and is an effort that has involved some trial and error. "One of the eye-openers for us was learning that the Taliban for the most part are better paid than the Afghan security forces, so that's something that we and the Afghans have already taken steps to correct," Gates told reporters on the way to Afghanistan. "I think, frankly, that's the biggest obstacle." The Afghan president is under intense pressure to clean up government corruption, a task he said is under way. "I have fired people and I will be firing people," Karzai said. Some of those changes will become known when Karzai announces his new Cabinet. The Afghan president said at the news conference with Gates that he would try to get a list to parliament by the middle of next week. Karzai was originally expected to submit the list on Tuesday.